Let it be Lowenbrau at the library? 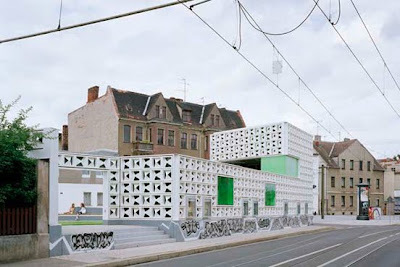 Residents of Magdeburg, Germany wanted a library in their economically decimated downtown, so they built one themselves. And made it out 1,000 recycled beer cartons. 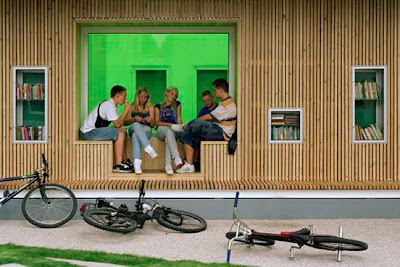 The project began in response to the closing of the neighborhood's branch library. Faced with high unemployment and an 80% vacancy rate for central city real estate, the community needed a gathering place to maintain civic pride. The pop-up beer carton library was created with the help of a tiny Leipzig firm KARO Architekten. It survived for only two days, but the citizens remained inspired. Downtown dwellers continued to collect donated books, and stored them in one of all too many abandoned storefronts. The makeshift collection eventually held 20,000 volumes. Fundraisers were held, and grant applications submitted. Ultimately a government grant for a permanent library came Magdeburg's way. 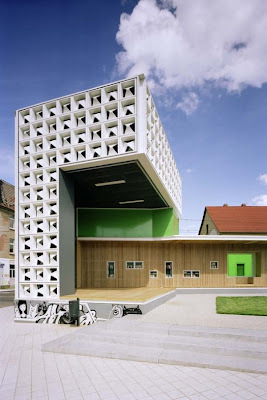 The citizens of Magdeburg showed an admirable loyalty to both the architectural firm that built with beer cartons, and to creative recycling: the commission for the permanent library was given to KARO, and the building was made with modernist cast concrete blocks salvaged from the facade of an abandoned warehouse. 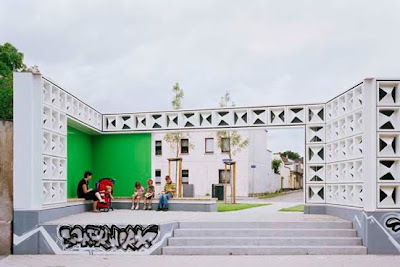 The permanent structure boasts a unusual open-air design, with communal space dedicated to an outdoor theatre which hosts school plays, poetry slams, public readings, and live music. The populist spirit of the original beer carton library is retained in the library's liberal lending policies: no library cards, no late fees, and no limits on loans. Magdeburg calls this a "Library of Confidence." The book collection is available 24 hours a day, and users are encouraged to replace each borrowed book with a new donation. (More recycling.) The staff is made up entirely of volunteers. And readers feel free to relax with a book and a bottle of--you guessed it--beer.